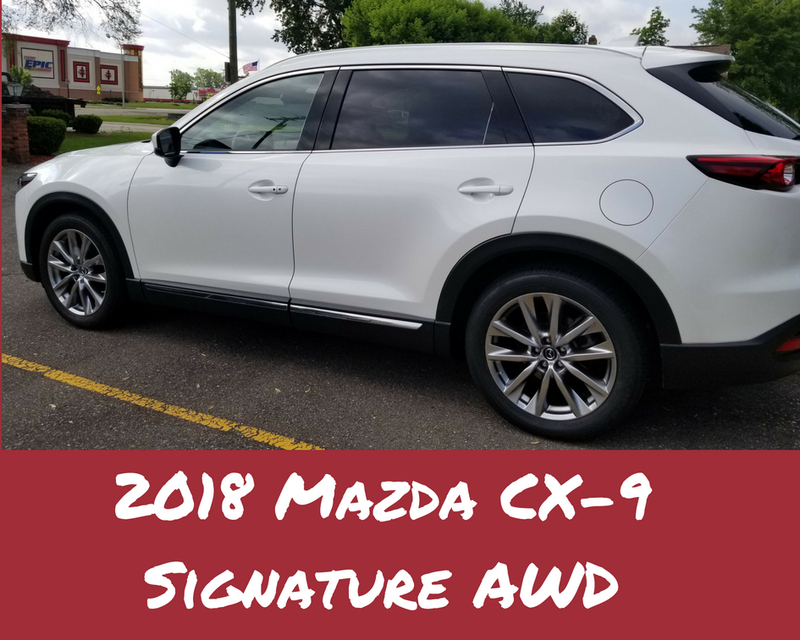 This weekend was super busy for me and I had a lot of driving to do, so I was glad that I had the 2018 Mazda CX-9 Signature AWD in which to do it. On Thursday, I drove from Clawson to Ann Arbor for the opening night of the Cinetopia film festival, and I stayed there overnight at a friend's apartment. On Friday, I drove to Farmington for a doctor's appointment, then to Walled Lake to see my parents and do some last-minute trip shopping with my mom. I then drove back to Ann Arbor, and stayed there for 2 days for the festival, driving home to Clawson on Sunday. I also drove to/from Dearborn on Wednesday for one more Cinetopia film. 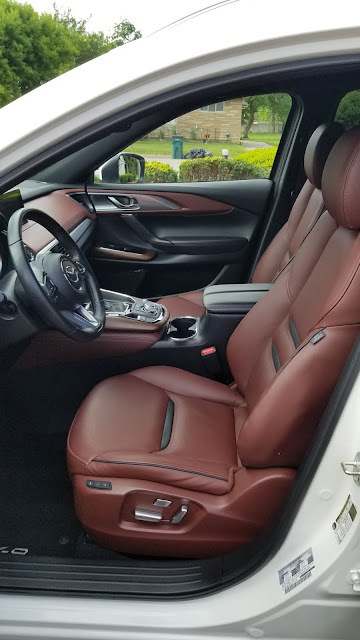 One of the first things I noticed about this car was its luxe interior—it has nappa leather-trimmed upholstry, and the leather was a dark red color. Very pretty, and very striking. The outside of the car is "Snowflake White Pearl," aka white. 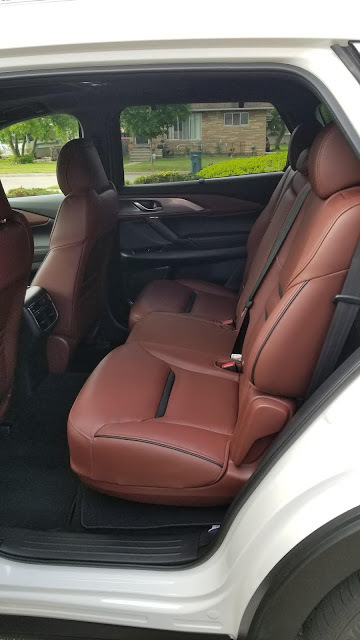 There's plenty of trunk space in this car, but if you push down the 3rd row seats (the car seats seven people in total), you'll have even more trunk space, which is what I did—though I ended up not needing that much trunk space. The car's average mpg is 23, with 20 city and 26 highway, but I was amazed at the gas mileage: after all of my weekend travels, and then a trip to Dearborn and back, I was only at slightly less than half a tank. The car is designed for comfort in mind for everyone who rides in it—the front has a heated steering wheel and both front seats have heated seats as well as power seat adjustments, with driver's seat memory up to two positions. 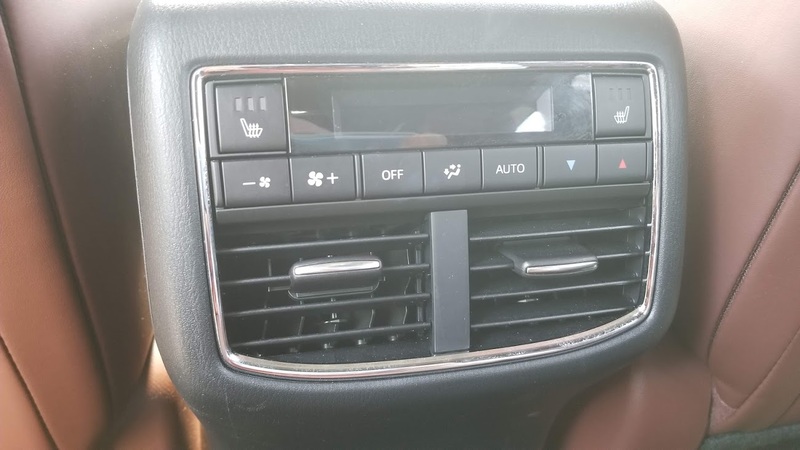 Even the backseats (2nd row seating) have heated seats, with their own air vents and the ability to turn the air up or down, as you can see in the above picture. I'd be remiss if I didn't mention that it has adaptive cruise control, which is my favorite car feature to have while highway-driving. It also has blind spot monitoring and lane departure warning to keep you safe. 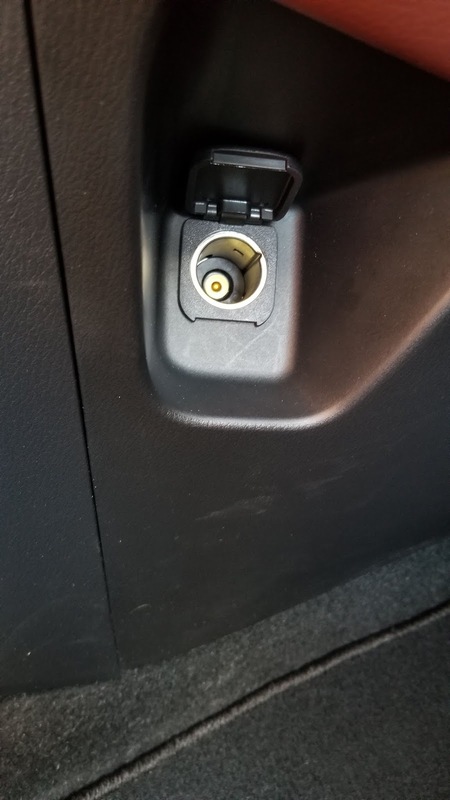 One of the first things I do when I get into a new (to me) car is to find the cigarette lighter, so I can plug my fast-charger in. 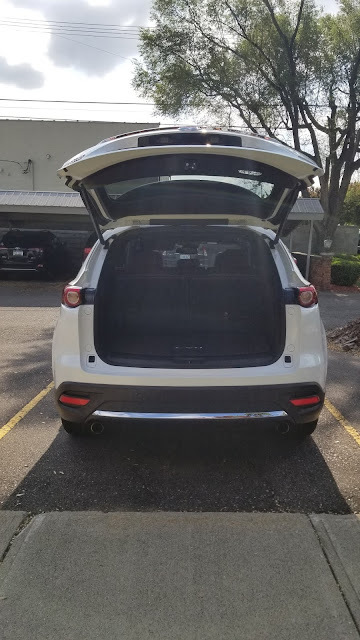 I actually had to Google where to find it in this car, because it's rather hidden: it can be found in the passenger seat area, to the left of where your feet would be. 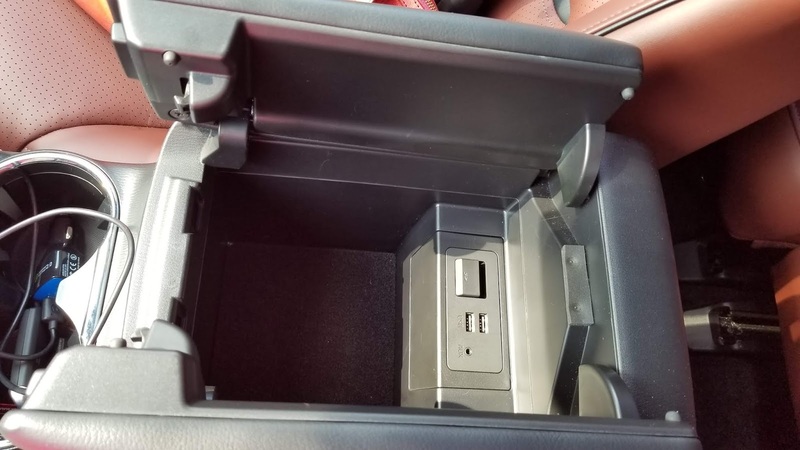 The middle compartment in the car also has two USB charger ports if you'd rather charge your phone that way. 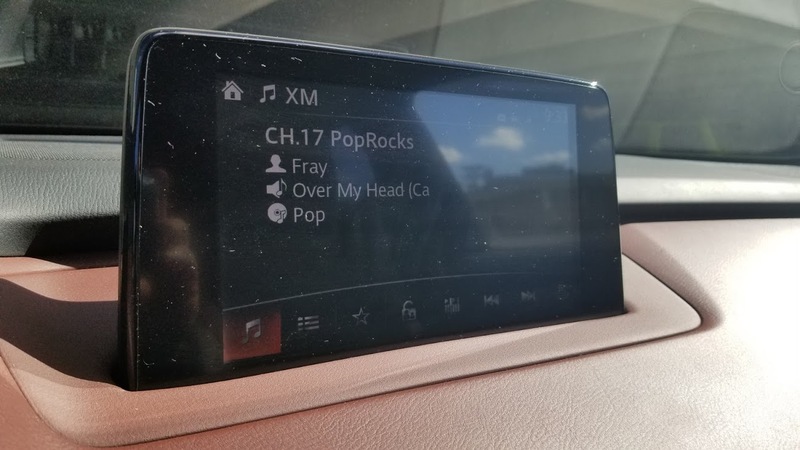 The touchscreen has a variety of music options, including Pandora, which synced up well with my phone, Sirius XM radio, and your standard AM/FM options. You can also listen to music via your phone's Bluetooth. The car also has a moonroof, rear privacy glass, and a push-button start. I was a little worried leaving packages in the car over the weekend (clothing, etc. that I had bought on Friday) but with the rear privacy glass, you really would have to press your nose against the glass to see in to the car's trunk area. 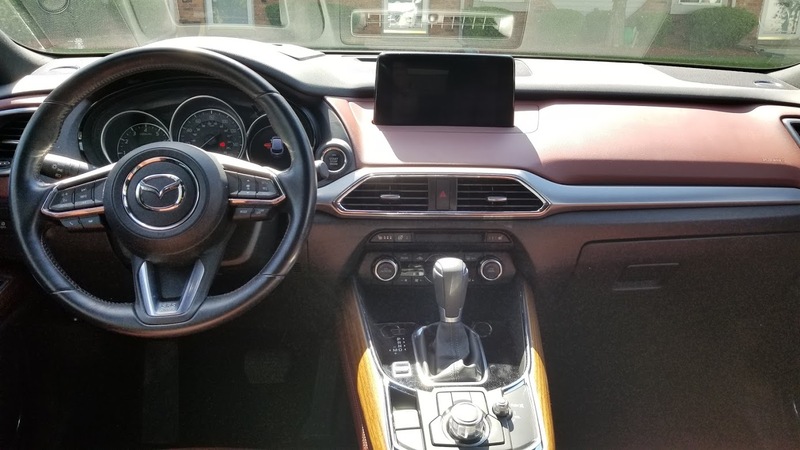 My favorite features of this car were definitely the adaptive cruise control, the interior design, and how roomy it is. The friend I drove with to Dearborn on Wednesday remarked that the SUV drove so smooth—"almost like a Lincoln," was her exact phrasing—and I'd have to agree. The CX-9 handled Michigan's pothole-ridden roads like a champ. 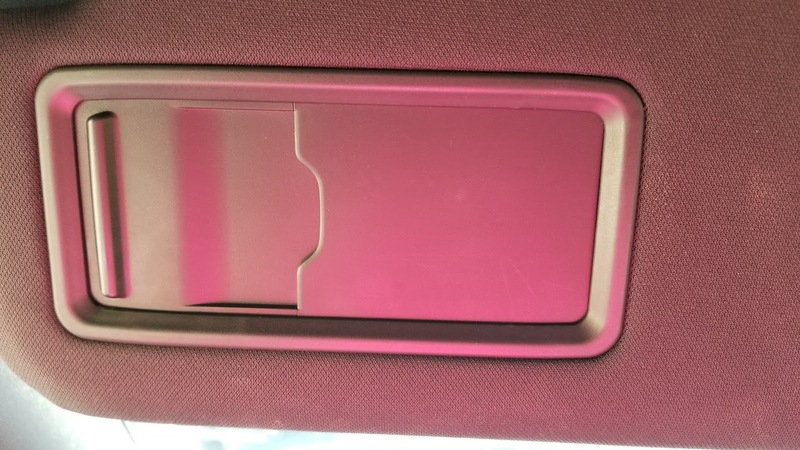 There are a few other little touches that were interesting, too—on the driver's side window, when you pull down the (sun blocker? ), there's a place to leave credit cards or other card-shaped things. This could be convenient while traveling. 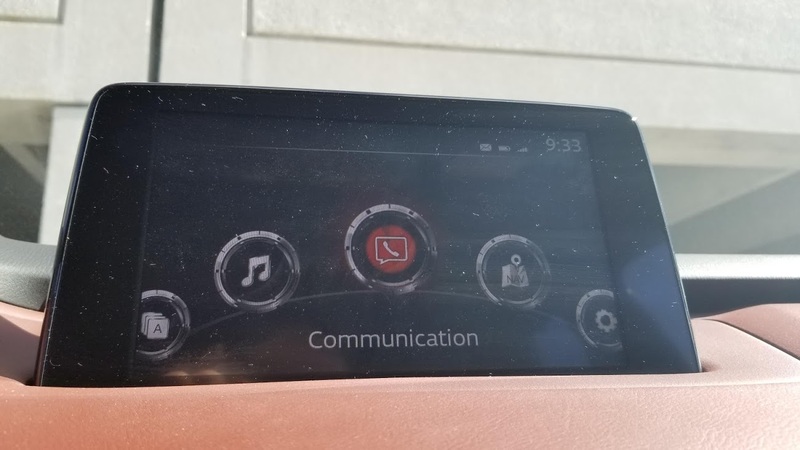 In the Mazda CX-3 Grand Touring AWD that I reviewed back in October, there was a feature that when you turned the car on, a little screen would pop up on top of the steering wheel, and your speed plus the road's speed limit were projected onto this—it's called Active Driving Display. With this car, that information was actually projected onto the bottom of the windshield, which took me a while to adapt to; I wasn't a huge fan of it, but by the end of the week, I had pretty much stopped noticing it. 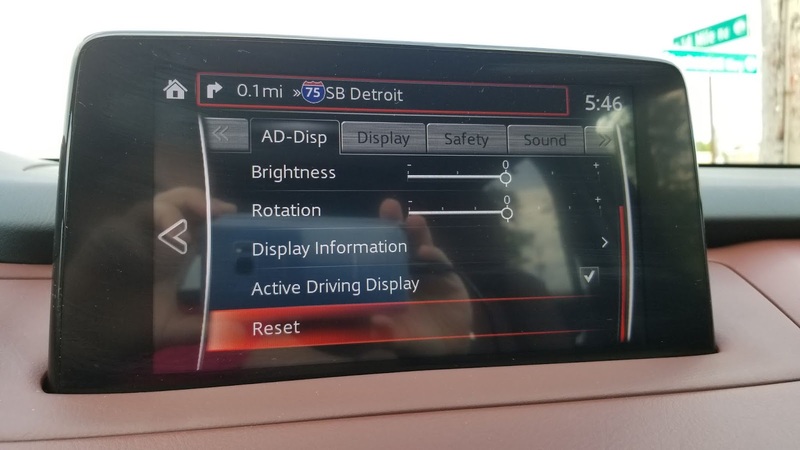 There's an option to turn it off in Settings, but it seemed to reset every time I turned the car on and off. 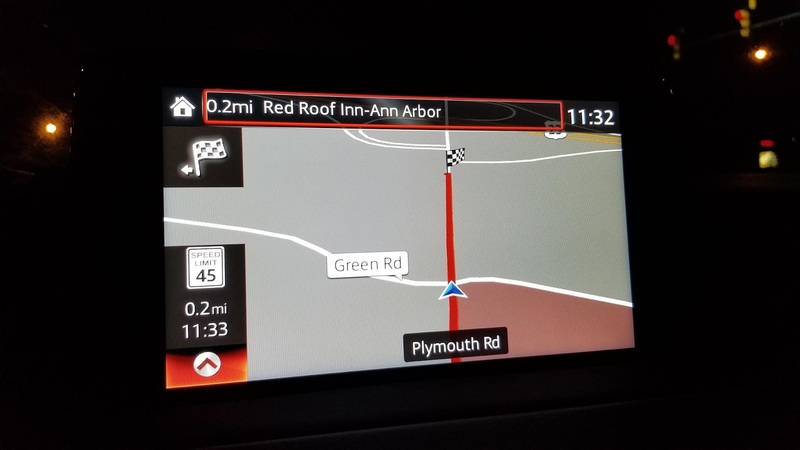 When you use navigation, that's projected onto it too, which could be useful vs. looking at the touchscreen for directions, though. Overall, I'm definitely a fan of the Mazda CX-9 Signature AWD, and I missed driving it today when I got in my personal car to head to work. The Mazda CX-9 Sport starts at $32,120, and the Signature, which is the one I drove, starts at $44,315. Click here for more information. 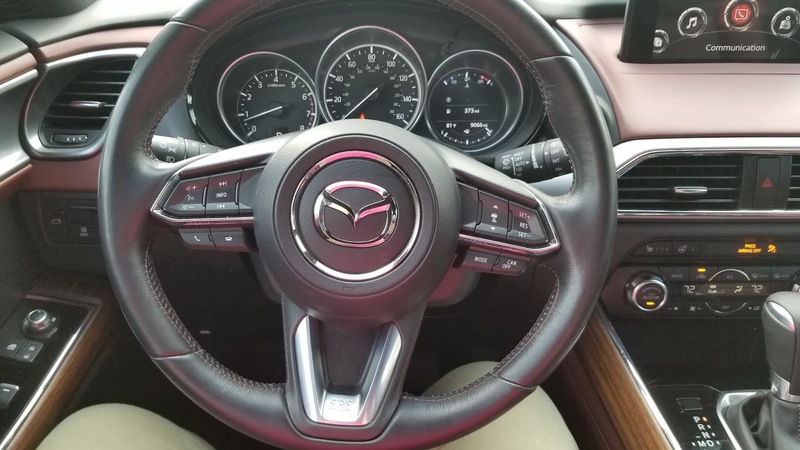 Have you ever driven a Mazda SUV before? If so, how was your experience?